Want to look cool and save on fuel? Want to get a budget vehicle for your scooting convenience? Auto Moto’s three-wheeler is a nimble but mean machine that caters to modern lifestyle needs. The three-wheeler can seat two comfortably with armrests thrown in for the passengers. Users can also make use of the locker storage or trunk at the back for their worldly possessions. The machine has a carbon-fiber style dashboard and speakers with MP3 connectivity. The CVT (Automatic Continuously Variable Transmission) provides optimal engine power while the tilting ‘rocker system’ allows the vehicle to take sharp corners safely and in style. The sunroof and full windshield protect riders from the elements. Owners are spoiled as there are nine colors curently available for The Auto Moto to choose from. This economical alternative to cars come timely as the US faces economic slowdown. 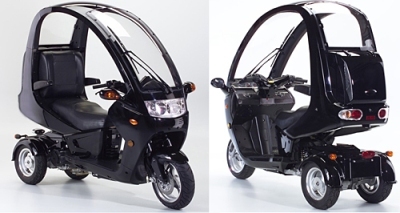 The Auto Moto’s three-wheel drive allows you to zip around in comfort at a cheaper cost.